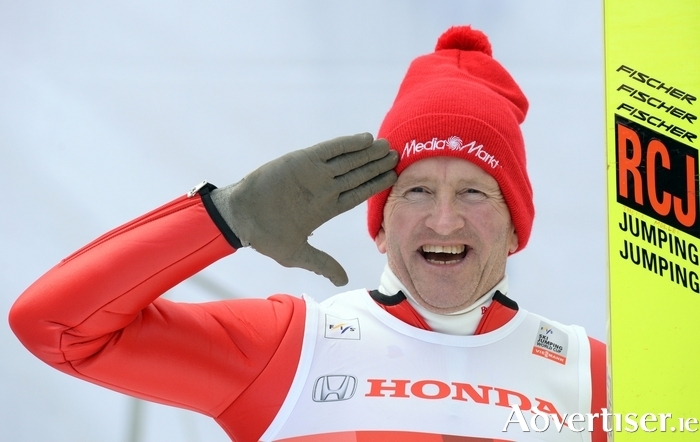 AMONG THE many colourful characters rocking up in Galway for the Vodafone Comedy Carnival, few are more colourful than Eddie ‘the Eagle’ Edwards, the unlikely star of 1988’s Winter Olympics in Calgary and Great Britain’s first-ever Olympic ski jumper. Eddie The Eagle – passport name: Michael Edwards - missed out on the medals (by a mile! ) but won the hearts of the world with his plucky have-a-go spirit and self-effacing persona. When he returned home to England he realised he had become an overnight celebrity…at which point his life became extremely strange. His show, The Eagle Who Dared, which comes to the Town Hall Theatre, is a family-friendly autobiography live on stage, featuring never-before-told tales, a blizzard of hilarious anecdotes, and more ups and downs than a self-taught Olympic ski jumper (ranging from TV game show Celebrity Squares to bankruptcy, through facial reconstruction and divorce to being affirmed as a national treasure ). Eddie’s unique story of flying against-all-odds shows what is possible when you dare to follow your dream. Earlier this year Eddie’s life story and remarkable Olympic adventure was celebrated in the Dexter Fletcher-directed big budget film, Eddie the Eagle, which was greeted with rave reviews ("a classy, comic tale," The Guardian; "a solid gold winner," Empire ). When I catch up with him for a chat ahead of his Galway visit I begin by asking if he was happy with how the film came out and if he had much involvement in the making of it. I suggest the sudden onset of fame and celebrity status that hit his life as a result of Calgary must have been quite a culture shock. “Yes it was,” he agrees. “When I first went to Calgary nobody knew me and then two weeks later the whole world knew who I was so it was a bit of a shock allright. But it was good fun, I travelled all over the world opening shopping centres and golf courses and hotels and having a whale of a time, though it was not something that I’d been anticipating or particularly wanted to do. I was forced out of ski jumping after Calgary so the only route open to me was to be a celebrity and make money that way. Despite his time as a celeb, Edwards still comes across as warm, personable, and down to earth and one imagines he would make a genial storyteller as he recounts his many adventures and encounters in The Eagle Who Dared. Page generated in 0.0689 seconds.